It’s no secret that our increasingly sedentary lifestyles are contributing to rising obesity rates and musculoskeletal disorders such as carpal tunnel and mechanical back syndrome. Thankfully, 'ergonomic office solutions' brand FlexiSpot has developed a product that combines exercise and work. 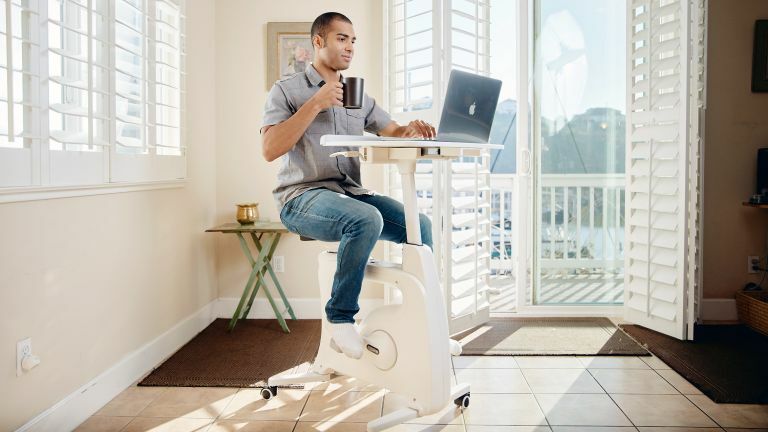 It is a desk… that you pedal. Yup. It's actually a range of exercise desks, with the flagship product being the FlexiSpot Deskcise Pro, which the brand proclaims to be the world’s first sit-stand-cycle desk. Part exercise bike, part standing desk, the Deskcise Pro is ergonomically designed, allows for low-impact motion and has a desk large enough for laptops, tablets, notebooks and mobile phones. It's perhaps the ideal combination of productivity and exercise, and also great for anyone who feels their current office desk just doesn't look enough like an exercise bike. When working and working out from the comfort of your own home you can also watch your favourite TV show on your laptop whilst having a nice cup of tea. It’s height adjustable, so whenever you feel like taking a break from breaking a sweat, the bike can be turned into a standing desk in no time. Whilst this may not be the fastest route to weight loss, remaining seated (and not furiously pedalling) for long periods has been associated with weight gain, as well as a range of health hazards. Why not make yourself the office favourite by demanding your boss invests in a suite of bikes today? The desk is described as ultra-silent, which means you can pedal away at high speed without annoying your less fit co-workers. At £499.99 the Deskcise Pro is equivalent to just ten month's membership at a premium gym, so is a solid fitness investment.